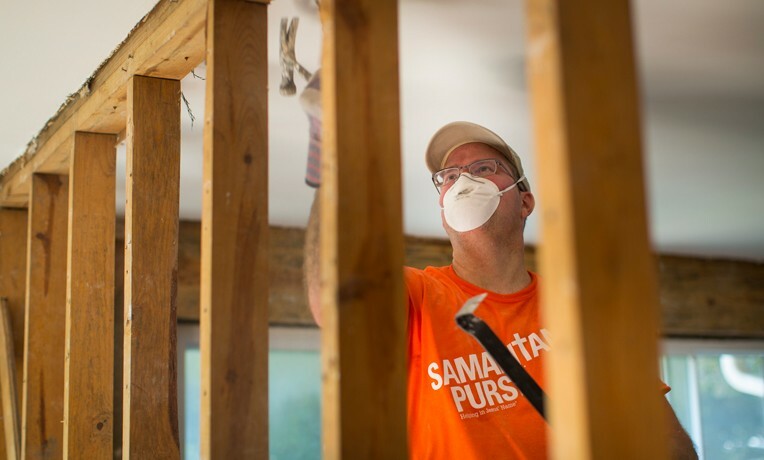 Samaritan’s Purse volunteers are helping homeowners in Butte County where the Camp Fire destroyed thousands of homes. There wasn’t much time to flee Paradise as the Camp Fire roared across Butte County, California. Residents reported harrowing escapes with their shoes heating up under them as they abandoned cars stuck on melting tires. Before it was fully contained, the Camp Fire burned more than 14,000 homes and over 150,000 acres in Butte County in the most deadly and destructive wildfire in modern California history. More than 80 related deaths have been reported in the region. At our base of operations at Calvary Chapel Chico, we have received more than 1,500 work orders from homeowners needing assistance with recovery efforts, and volunteer teams are responding as areas slowly open up. The need for volunteers will continue to grow as we gain access to the more populated areas devastated by the fire. But God is already at work in parts of the region as we serve hurting residents. Ed and Phyllis Mannion were among the first homeowners we’ve helped in the area. They describe a narrow escape, speeding away from all they had known as a 15-foot wall of flames formed on the horizon. It would be the last time they saw the house they had built themselves 38 years ago. When they returned to the hill they had called home for so long, they found only mangled metal pieces amid piles and piles of ash. Marc and Janice Brusie survey their property through the window of one standing wall at their home. Our volunteers helped Ed sift through the ashes where we recovered small pieces of pottery and other valuables containing decades of meaning for the couple. The property of Marc and Janice Brusie is another one of a handful of residences where Samaritan’s Purse has been able to work. Our volunteer team found some valuable keepsakes in the ashes for the Brusies, prayed for them, and presented them a new study Bible signed by our volunteer team. “Samaritan’s Purse is making a huge difference,” Marc said. Partnering with Billy Graham Rapid Response Team chaplains, we praise God that 20 people have already prayed to receive Jesus Christ as their Lord and Savior during the early days of this response. Steve Snow, area coordinator for Operation Christmas Child, prays with local church leaders over salvaged shoebox gifts. Ed Mannion returned to his Butte County property to find his home destroyed by fire. Many homes in Butte County were reduced to ashes as the Camp Fire blazed through. Butte County residents had to scramble for shelter after evacuating their homes during the Camp Fire. Volunteers sift through ashes at a Butte County home. Volunteers pray with Marc Brusie during work at his Butte County home. Volunteers are working hard to help homeowners with the arduous task of recovering valuables and keepsakes. Marc Brusie hugs a volunteer after being presented with a Bible signed by the team. Only a handful of valuables were recovered from the Mannion property, but they are filled with decades of meaning. We are also thankful that He continues to show His faithfulness in the small details. Some local congregations have collected Operation Christmas Child shoeboxes from homeowners affected by the fires. These homeowners willingly chose to carry out these gifts for children in need, even as they were fleeing their own homes. In addition, a number of churches were able to recover shoebox gifts from their worship centers, which had surprisingly been spared from the flames. Operation Christmas Child Area Coordinator Steve Snow said they had not expected to receive any shoebox gifts following the Camp Fire. They were amazed to find almost a hundred unscathed throughout Paradise. Please pray for so many hurting people in this part of California. Pray also for compassion and boldness in witness as Samaritan’s Purse teams and Billy Graham Rapid Response Team chaplains minister to those affected by the fire. The overwhelming need is an opportunity for God’s people to make His care and concern evident to all.